Britain's Prince Harry and his wife Meghan returned to Australia yesterday from a tour of Pacific islands after their plane was forced to abort a first landing because another was in the way. Their Qantas plane, approaching Sydney, dropped to 125 feet before performing a "go-around", according to FlightRadar24. A go-around is when a pilot pulls out of a landing and makes another attempt after circling the airport. According to the civil aviation experts, a go-around is a "common and very safe practice". A witness on the plane said the entire episode was calm. The pilot explained that a plane had been slower than anticipated rolling off the runway so they were going around and everyone would get "another chance for a good look at the amazing views of Sydney Harbour". A Qantas spokeswoman said: "The captain advised those on board that they'd be doing a go-around as there was another aircraft on the runway that took longer than expected to take-off." The plane landed safely at around 6pm local time. In Australia, more than 800 standard go-arounds are performed in a typical year. Today, the royal couple will attend the closing of the Invictus Games, which are being held Sydney. The games, founded by Harry, are an international paralympic-style event for military personnel wounded in action. They will then visit New Zealand as part of their 16-day Commonwealth tour. Earlier yesterday, the pair donned garlands of red flowers and handmade wrap skirts called ta'ovala, given as a traditional sign of respect, to tour the island nation of Tonga. They met Tongan prime minister Akilisi Pohiva at a government building, funded by China but named the St George Building, in the capital, Nuku'alofa. On the way in, Harry stopped to embrace a small boy who was holding a sign that read: "Free hugs!" Tonga, a country of 170 reef-fringed tropical islands and 108,000 people, is a former British colony. The couple, who are expecting their first child in the spring, were serenaded by students at Tupou College, and called in at the Royal Palace, feted everywhere by excited crowds waving flags and signs celebrating the visit. They laughed when boys from the college sang about mosquitoes, complete with dance moves, at a ceremony to dedicate two forest reserves on the campus. Schoolchildren later lined the route to the airport, where the couple walked over a carpet of woven mats to their plane, which left for Australia in the afternoon and another round of royal appointments. 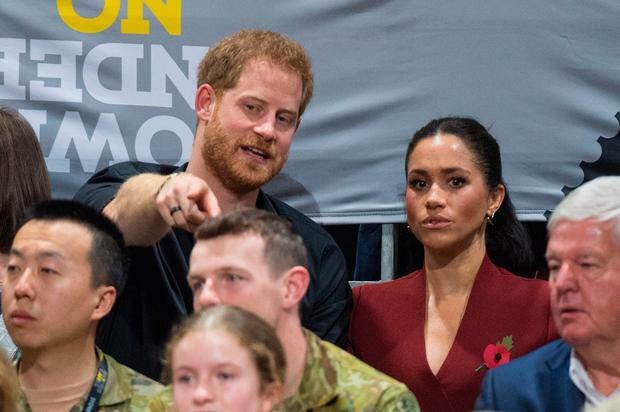 Meanwhile, David Beckham, Harry and Meghan were among the crowds watching the wheelchair basketball finals at the Invictus Games on the last day of the competition. The Duke and Duchess of Sussex returned to Australia from Tonga on Friday afternoon to watch the Netherlands and United States spar off for the last gold medal of the Games at the Quaycentre. The parents-to-be later went on to the Qudos Bank Arena at the Olympic Park complex for the closing ceremony of the Games on Saturday evening. More than 500 competitors have taken part in eight days of sports in Sydney as part of Invictus - the Games for wounded, injured and ill servicemen and women. Beckham, an ambassador for the Games, has spoken of the power of sport. He said: "I know how sport can change people's lives, I know how sport has a real power to improve people's lives in many different ways. "It's been such an emotional week for everyone involved. 500 competitors, over 1000 family members is such a special thing. "These people have lived through difficult situations, and to see them perform in front of such an amazing crowd is really incredible. "The power of sport really shines through. Life changing experiences, it's what it's all about." The duke will speak at the closing ceremony before the couple head to New Zealand for the final leg of their 16-day tour which has also seen them visit Fiji and Tonga.